AINAN, Taiwan (IBAF Saturday, July 25, 2015)– The second day of the 2015 WBSC U-12 Baseball World Cup saw three shutouts, two of them one-hitters, and a grand slam. Both No. 8 South Korea and No. 16 Nicaragua threw one-hit shutouts Saturday morning to bounce back from losses sustained during Opening Day battles Friday. S. Korea knocked out No. 32 Russia, 12-0, in five innings. The loss for the 2014 U-12 European champions drops their record to 0-2 in Group A. 2014 U-12 Americas champs Nicaragua (1-1) belted two home runs in a 17-0 win against No. 27 France (0-2) in Group B. In a world No. 1 vs. No. 2 battle, the U.S. National Team blanked top-ranked Samurai Japan, 8-0, in what was only their second encounter in history at the U-12 level. 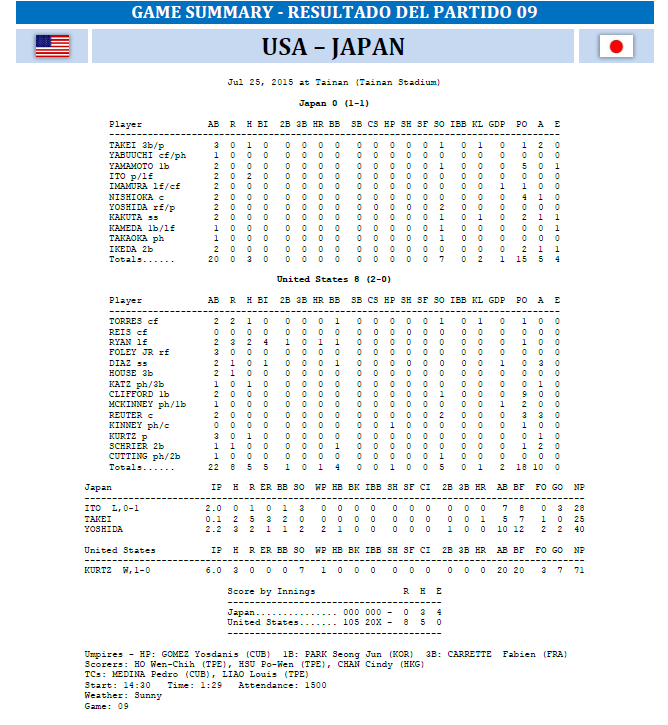 In their first-ever meeting, the U.S. defeated Japan in the semi-finals of the 2013 U-12 Baseball World Cup, on their way to being crowned U-12 World Champions. With the complete-game shutout by Nicholas Kurtz, USA improves its record to 2-0, while Japan drops to 1-1 in Group B. World No. 3 Cuba was outhit by No. 10 Venezuela in their contest, but the Cuban National Team pulled out an 8-2 victory, using two timely two-run doubles against Venezuela’s pitchers, who issued eight walks. Cuba improves to 2-0, while Venezuela moves to 1-1 in Group A. No. 12 Mexico and No. 14 Australia were locked in a toe-to-toe battle for the first three innings, with Mexico hanging on to a 3-1 lead, until Mexico’s Johan Cruz blasted a grand slam in the bottom of the 4th to help fend off the Oceania representatives. Mexico captured the game 9-1, which upgraded its record to 2-0 and dropped Australia to 0-2. In the final contest Saturday, No. 4 Chinese Taipei (2-0) put together 27 hits to score a 28-2 victory over the No. 15 Brazilian National Team (0-2). 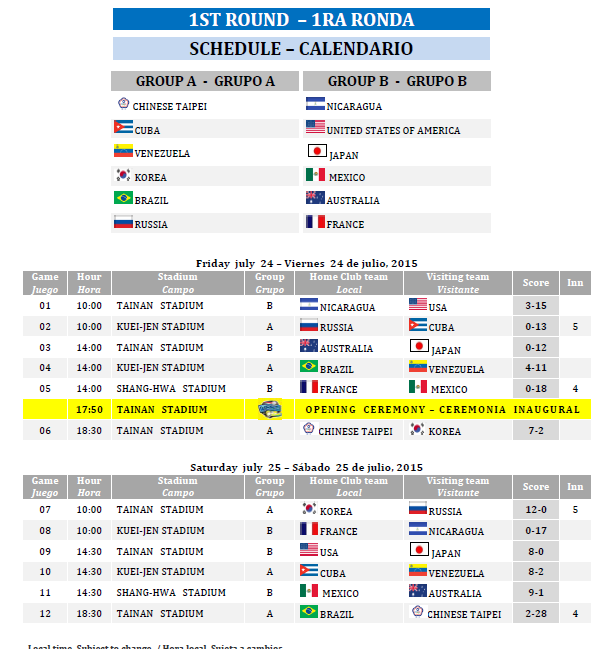 Action will continue on Day 3 of the 2015 U-12 Baseball World Cup on Sunday, where undefeated Chinese Taipei and Cuba are scheduled to meet for the first time since the two nations collided in the world championship finale of the 2011 U-12 Baseball World Cup, which was won by Chinese Taipei, 3-2. Following the Opening Round Robin, the top three nations from each Group will play each other in the Super Round. In total, 50 international contests are scheduled in Tainan to determine the 2015 U-12 World Championship.